This artistic rendering of a bundle of fresh carrots displays the abundant beauty of the natural world. Just as fetching as a vibrant bouquet, this artistic rendering of a bundle of fresh carrots displays the abundant beauty of the natural world. 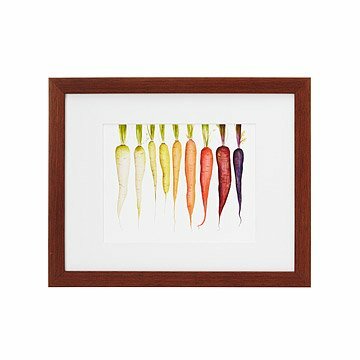 Boston-based artist and illustrator Kendyll Hillegas works in layers of gouache, watercolor, and colored pencil to create a rainbow of carrots plucked right from the earth. The color palette features delicate cream tones with hints of green and deep aubergine. With its texture, warmth, and straight-from-the-garden subject matter, her clever ode to common roughage is sure to make anyone fall in love with veggies. Printed in Oregon. Arrives walnut veneer frame and ready hang, or unframed in acid free mat. My wife is new to the organic food life and is enjoying trying new colorful vegetables. The most fascinating of these to her are the varieties of carrots and this was the perfect picture and gift. The only negative I have is the amount of time for standard shipping seems excessive. All aspects of the order went smoothly.